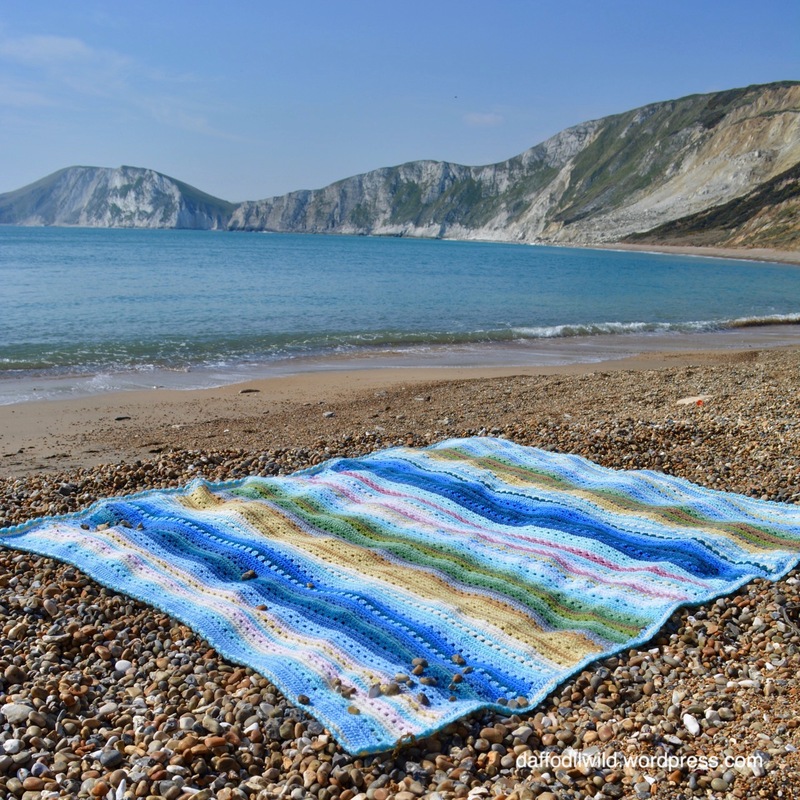 Last year, in April, I was in a quandry about which colours to use in my Coastal Cosy blanket – and you dear readers helped me out – pinks or no pinks that was the question. 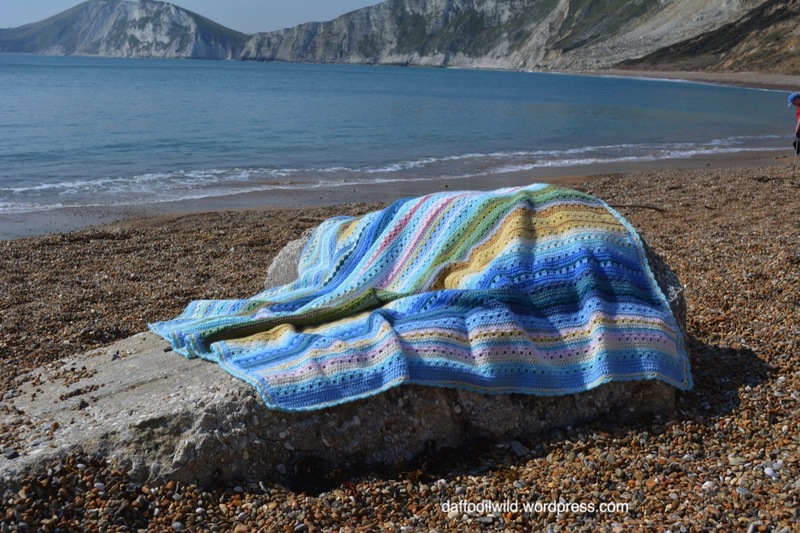 I finished the blanket back in the Autumn, but have been waiting for a suitable sunny day to take it to the beach for its Ta Dah! moment. oh my aching knees! but Oh! it was so worth it. 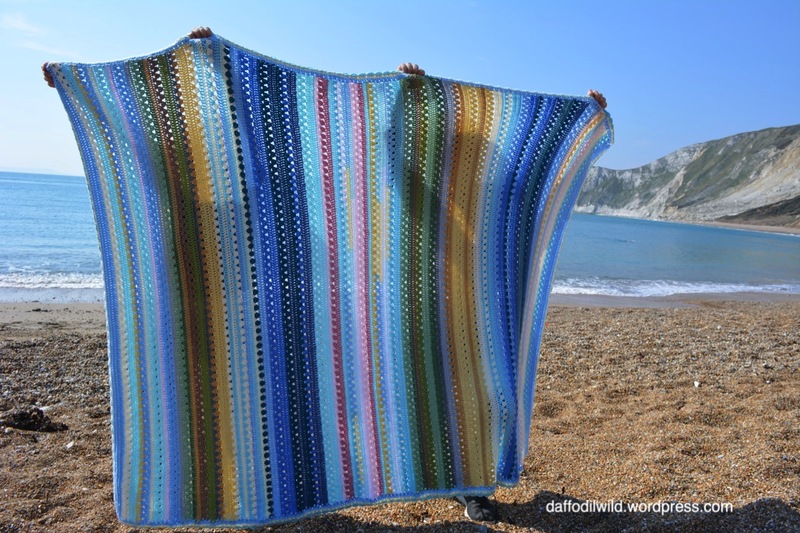 and because it went so beautifully with the colours there, it has been re-named the Worbarrow Bay Blanket. Master R and Little Miss M were happy to help me with the photo shoot. 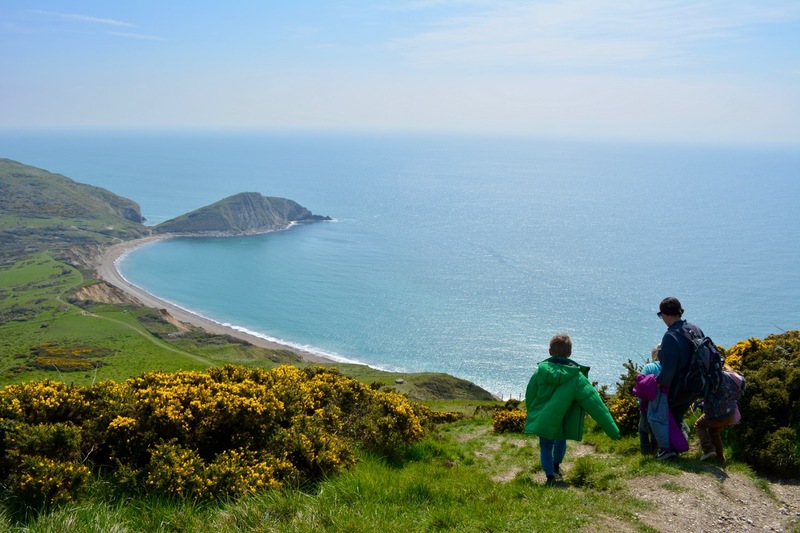 We walked 3.8 miles bringing the total number of miles walked by Little Miss M and me to 65 of our 500 mile target. 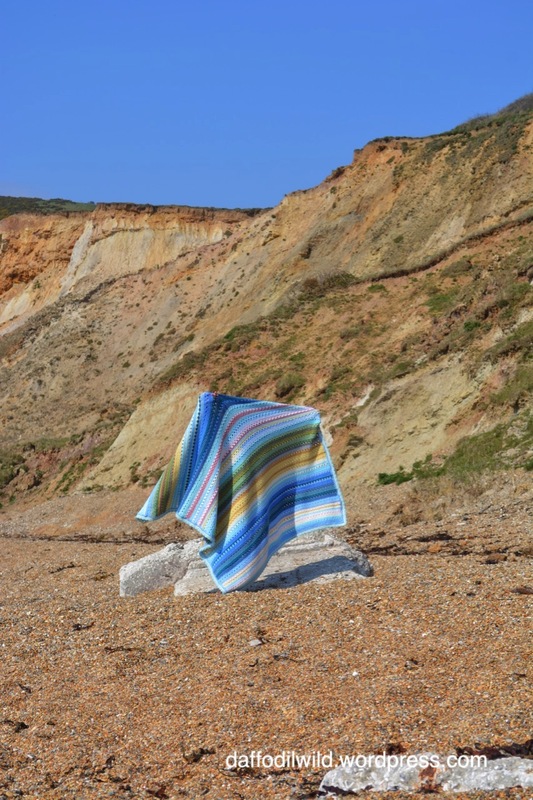 More details of the colour order and the edging of the Worbarrow Bay Blanket to follow in a future post. 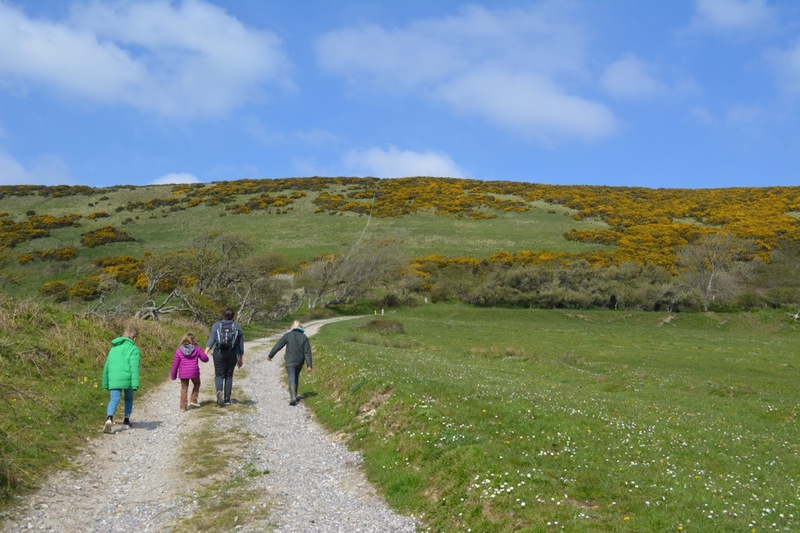 In case you would like to visit Tyneham and Worbarrow – here are the Opening times for this year. 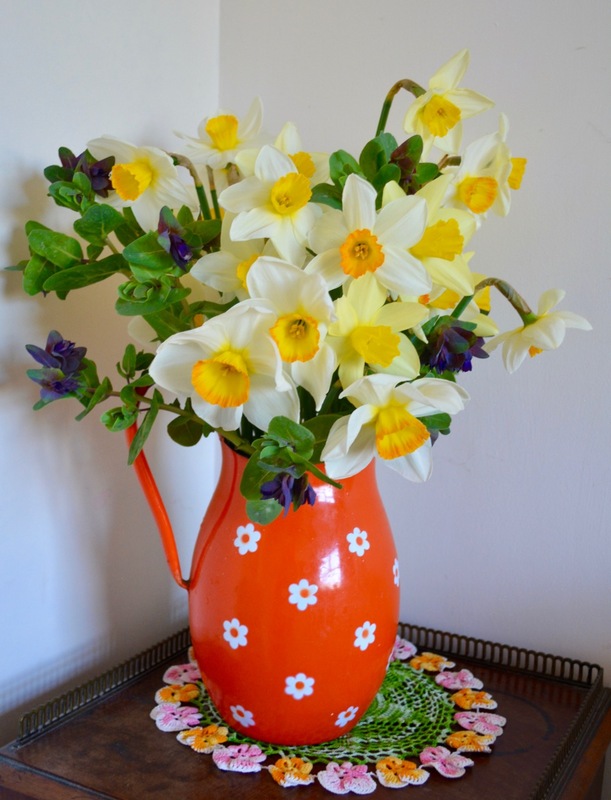 These lovely narcissi smell of spring. My daughter’s new home was once a Market Garden and the house sits amidst a field of these gorgeously uplifting bright blooms. She is currently looking at how she might sell some of the flowers and/or the bulbs, so any hints and tips you might have would be gratefully received. I have put them with cerinthe from my own garden, which seeded itself last year and survived the winter. They sit in a metal jug which was made in Yugoslavia and bought for me by my Mum from a market stall. 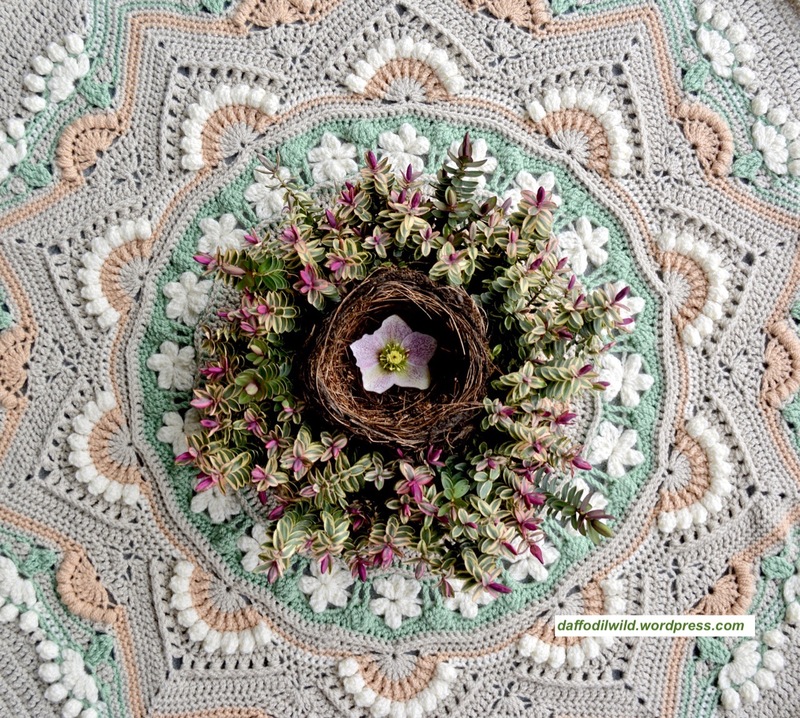 The crocheted pansy doily was made by my step-grandmother who I adored – she taught me many handicrafts including Hardanger embroidery. 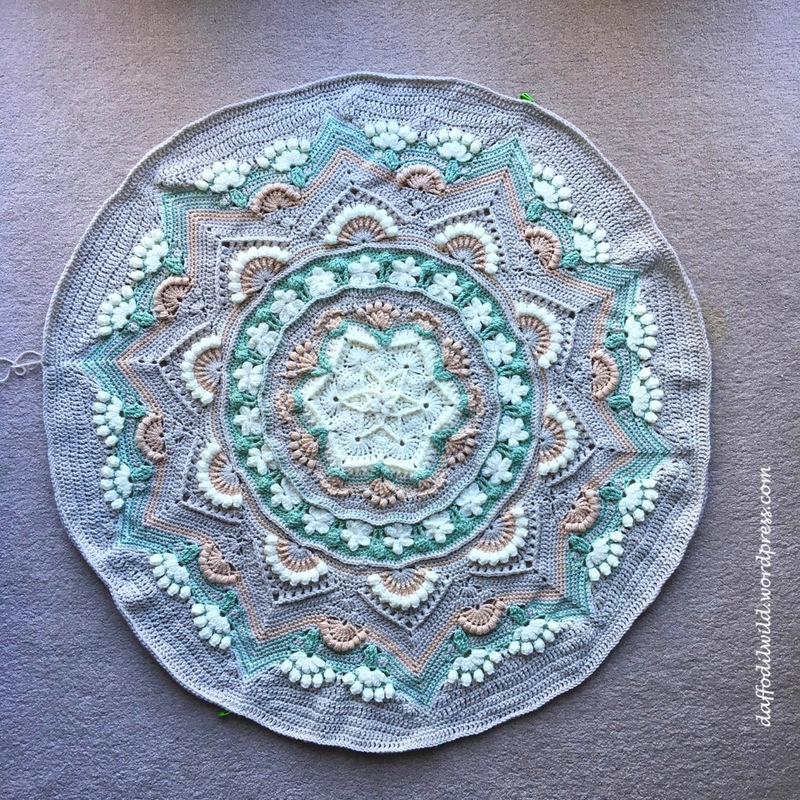 You can see the culmination of a wonderful Sew-Along over on Kathy’s blog – so pretty. I am joining in with Rambling in the Garden’s ‘In a Vase on Monday’ meme. Also joining Cee’s Flower of the Day. 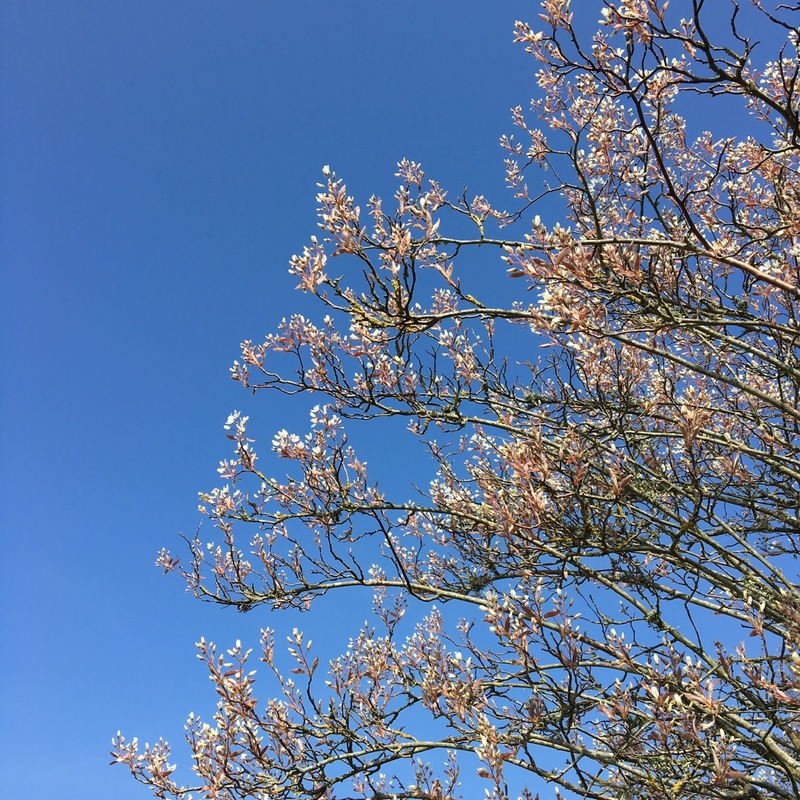 Amelanchier against a blue sky – Sprinnnnggggggg! 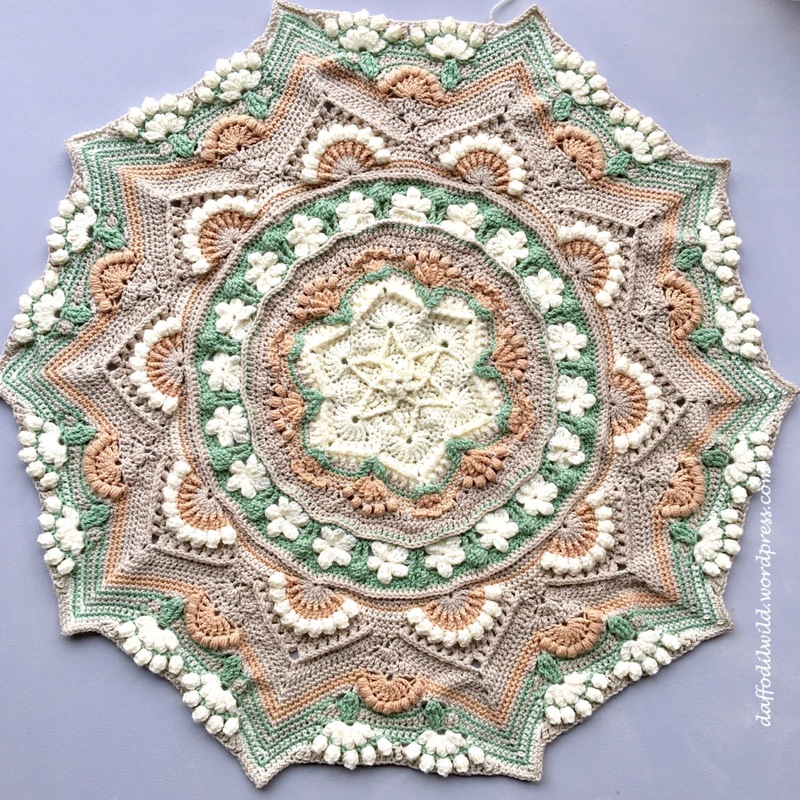 The pattern is Lost Garden by Helen Shrimpton. This colourway has gathered some lovely comments on Helen’s Hookaholics FB Group. 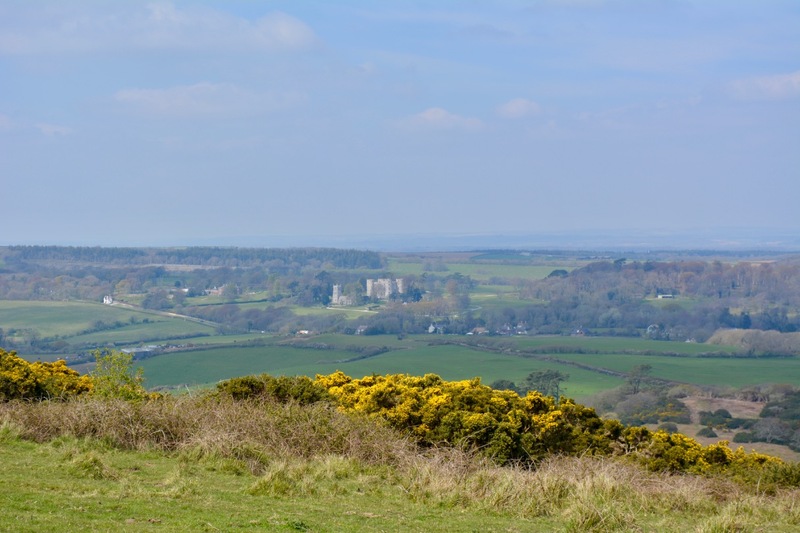 Some have said it reminds them of a Victorian design, Poldark, Meissen china or Snowdrops. See my previous post for colour order up until the corners here. It measures about 90cm square at this stage. I am going to wait for the new Stylecraft Colours to be released before I go any further. I think ‘Toy’ could work well in the border. I have been beavering away at a new blanket: Lost Garden, another gorgeous pattern from Helen Shrimpton. 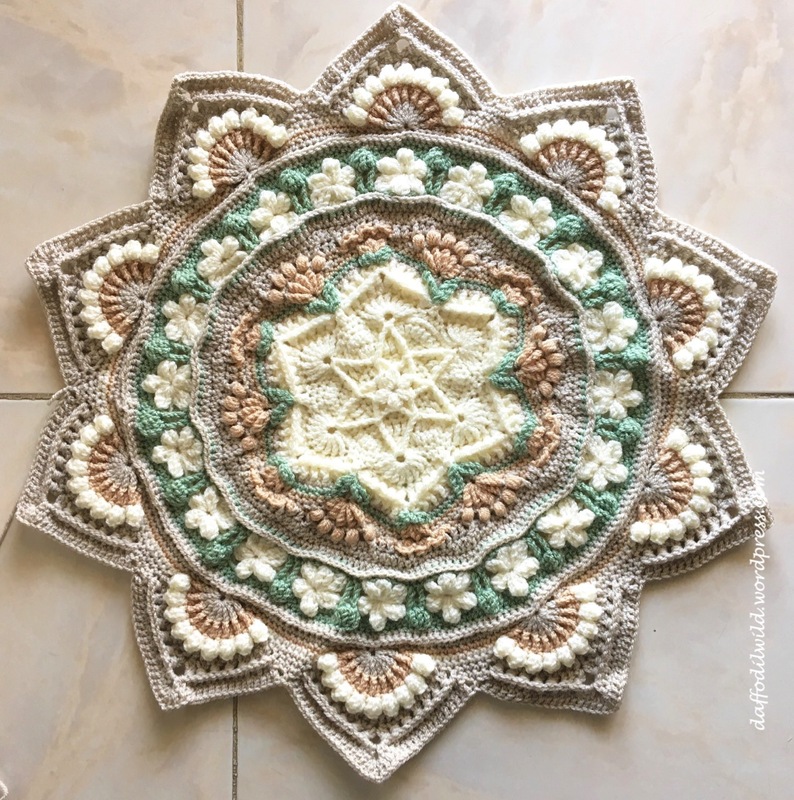 This one really is a joy and very relaxing to make. The yarn is Stylecraft Special DK and the colours are, from the top: Lincoln, Cream, Stone and Parchment. 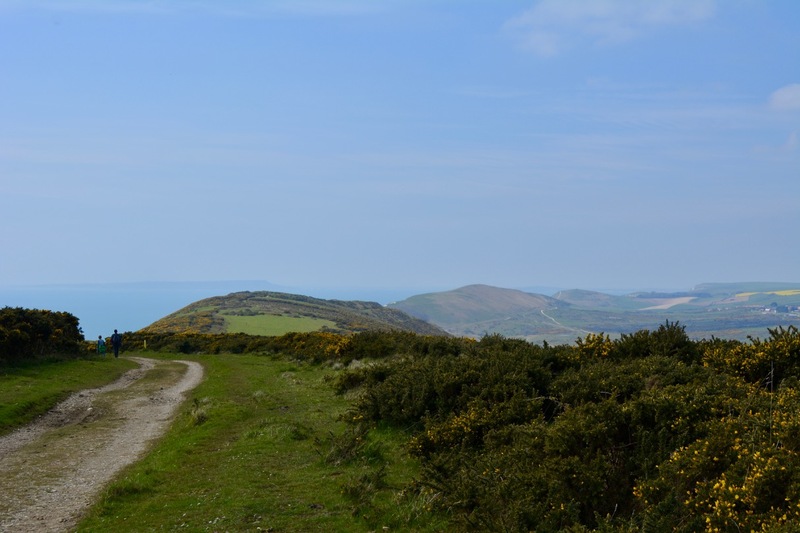 Helen has taken her inspiration from the Lost Gardens of Heligan – a favourite place of mine, full of history, magic and delight. Not a palette I would have chosen, but I am finding it oh so calming to work with. The photo above shows the truest colours and was taken in Egypt. It was my early morning project before the rest of the house was up and doing. The colours and their placement have got a lot of attention in the Helen’s Hookaholics Facebook Group. Some have said it looks Victorian, like a Meissen Plate and like Snowdrops. I love all these references – especially the snowdrops. This is just before I start to square the corners. It could look rather sophisticated in just grey and white don’t you think? 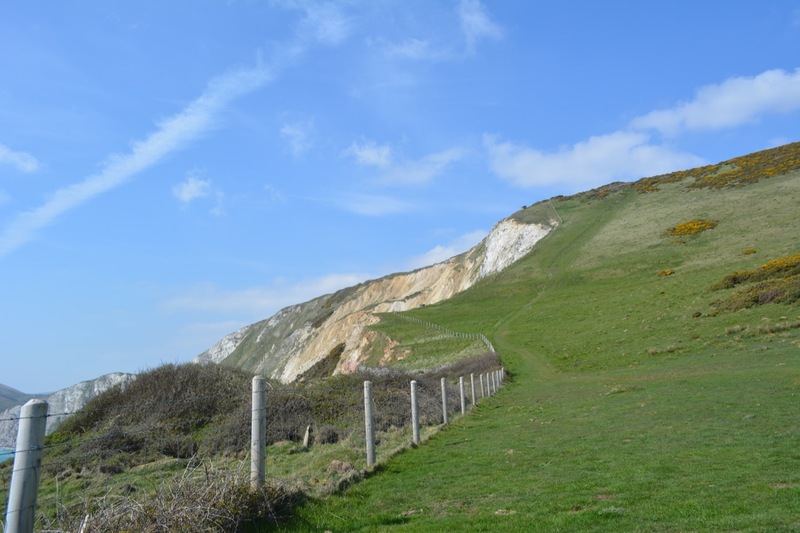 And for the next bit – the corners, see this post. Hellebore and Hebe in a Lost Garden. This little hebe is the star of the show in my garden at the moment, I just love it’s pink tips. 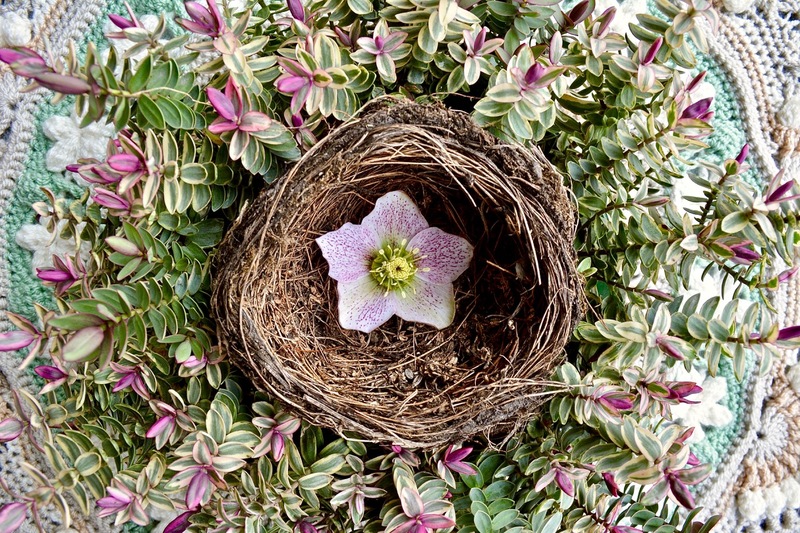 The hellebore sits in one of last year’s blackbird’s nest found in the loganberry which is trained against a wooden fence. 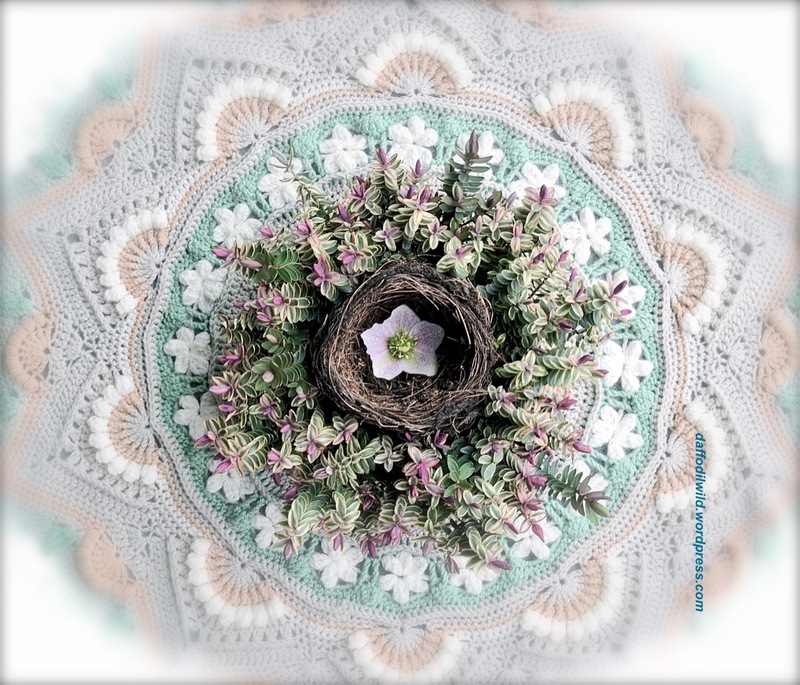 The crochet mandala is a pattern by Helen Shrimpton, called Lost Garden and inspired by the Lost Gardens of Helligan. 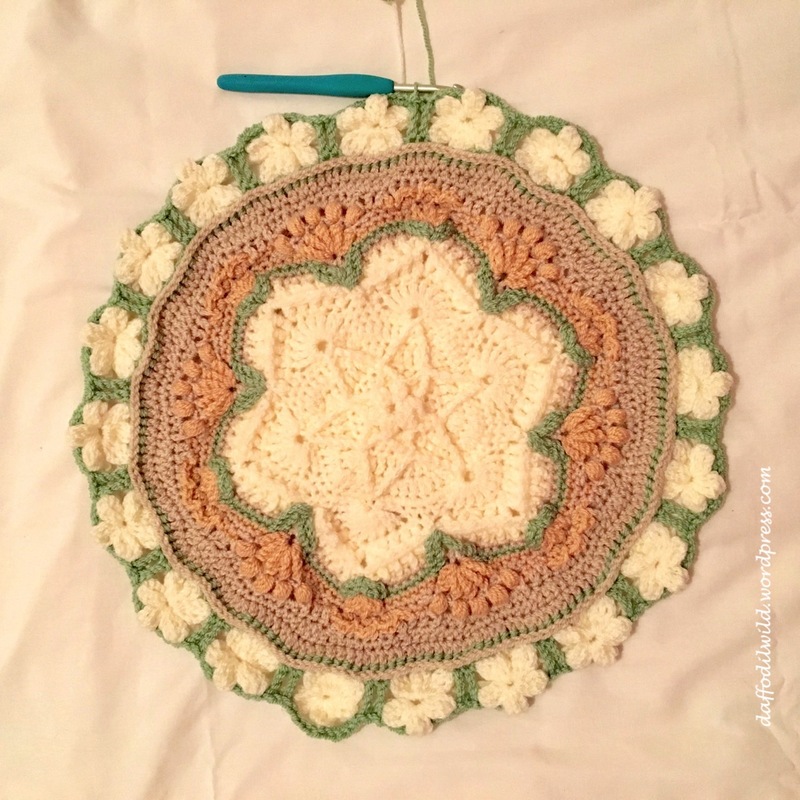 It will be a blanket. 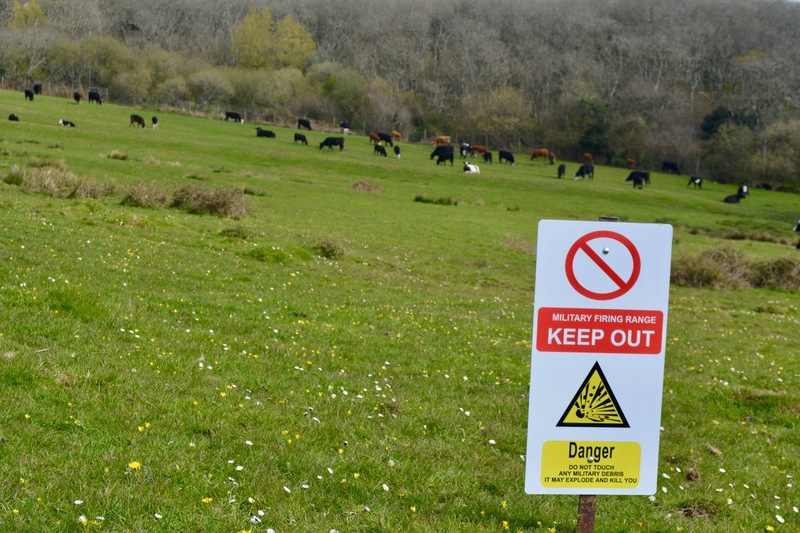 Do you think either would make a good greetings card? Pop along over to Cathy’s Garden blog and see what gardeners all over the world are putting in a Vase this Monday. Continuing with my Scrap-Happy-Stash-and-UFO-Busting-Blanket as mentioned in last month’s post. This was a perfect travelling companion: this photo taken at Gatwick whilst we were waiting to board the plane for a 5.5hr flight to Hurghada, Egypt. No scissors needed and the crochet hook passed through airport security no problem. I had taken other, more demanding projects with me for the week, but this was there for any odd moment of waiting around, or sitting chatting with a glass of pre-dinner Rosé. It measures Width 1m 20cm at its narrowest point , and 90cm Long. I intend to make it about 1m 75cm long and then add a one coloured edging – probably in the chunky pale turquoise yarn, as I have lots of that. You might have spotted that one side has gone a bit wonky, and I seem to have changed to a 5.5mm crochet hook along the way, but the joy of this sort of blanket is that I don’t mind about that and will just keep going, but I will decrease some stitches on the left side. 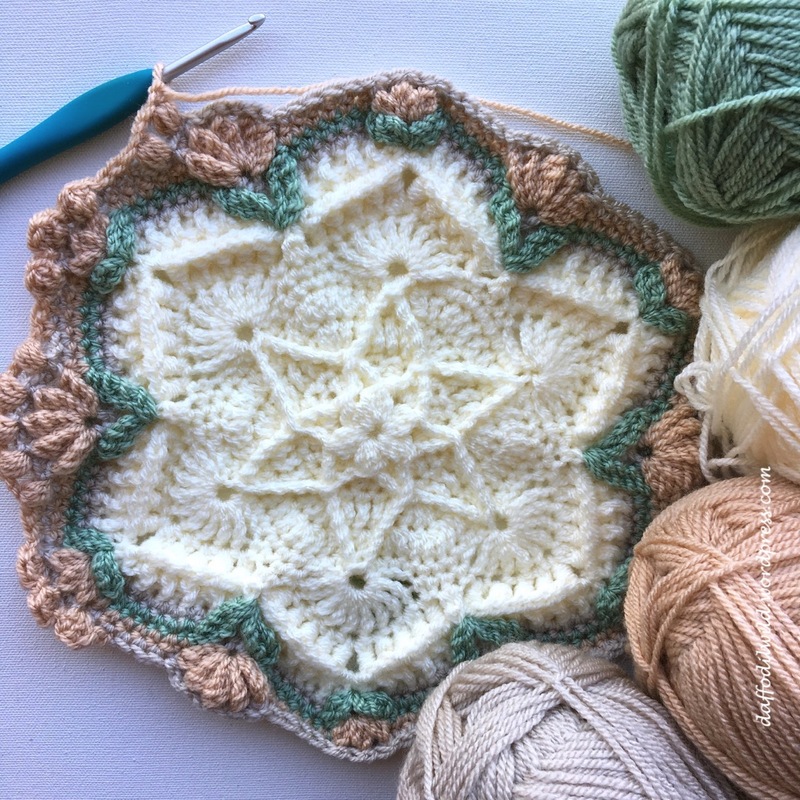 I just love crocheting this and watching for the next colour to come along, each one reminding me of a former project. 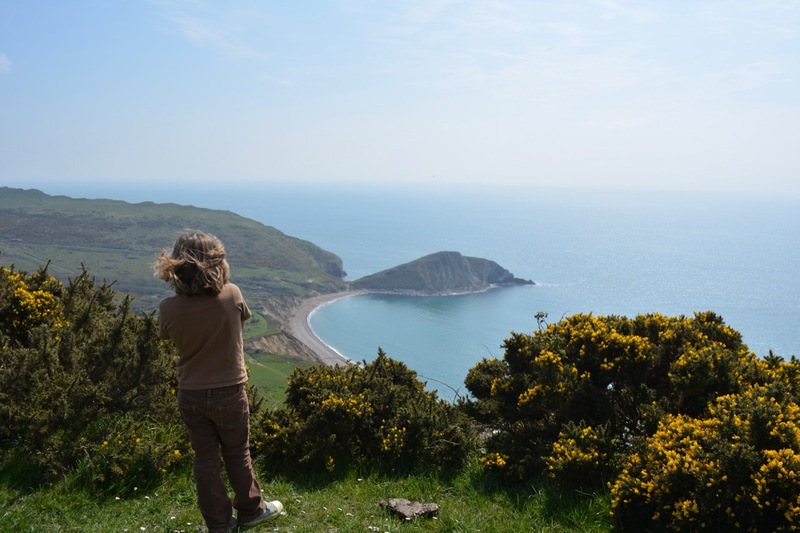 Pop across to Kate’s blog to see all the other Happy Scrappers.